The original Figo hatchback was a game changer for Ford India. It was their first small car, their first low priced car, and most importantly, it was the first Ford that was affordable to buy and run. But that's not why I'm a fan. No, that's because it is an absolute pleasure to drive despite its unremarkable engines. The hydraulic steering is beautifully communicative, the gearbox firm and precise and the Fiesta-based chassis a thorough delight. Despite being on its way out, it's easily the best handler in the sub-Rs 10 lakh segment. 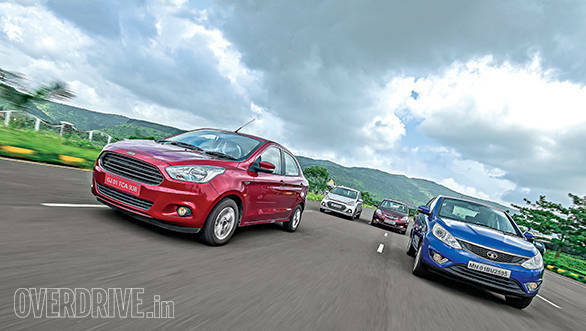 The new Figo Aspire is an equally important car for Ford. With the Fiesta moving in insignificant numbers and the EcoSport facing strong competition, Ford needs another strong seller. But can it make a big enough impression in the super competitive compact sedan segment? A segment so important that last month the Swift Dzire was the highest selling car in the country! As it turns out, Maruti are selling so many Dzires that they didn't have a single one to spare for this review. Nevertheless, while the Dzire may be a sales monster, there are other, more convincing options in the segment. Our previous champion, the Honda Amaze won because we loved the performance and efficiency its engine offered. 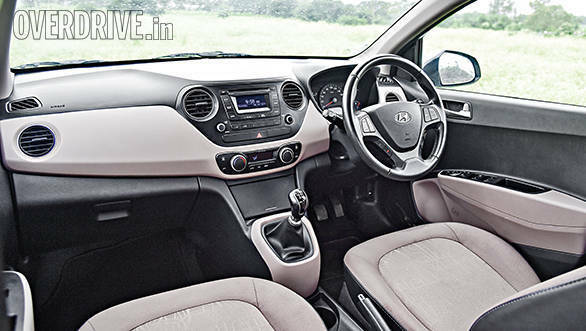 The Hyundai Xcent with its well appointed and inviting interiors came a very close second. The Zest, meanwhile, was a highly impressive effort from Tata and it stands to be a serious competitor in the segment. The Aspire has its work cut out. It doesn't take that long to see that the Aspire is about as handsome as a sedan can be when restricted to 4m. By setting up this rule, the Indian government has inadvertently created a class of effective, but rather ugly machines. Still, the Aspire gets off to a good start with that Aston Martin like grille while the rest of the body is taut and muscular. 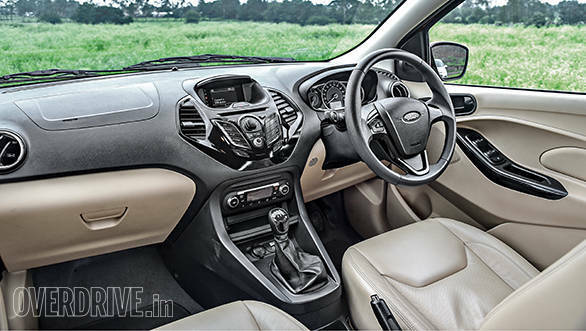 The good looks extend to the beige and black cabin which is based on the more expensive EcoSport, but even better executed. The design is thoughtful, with lots of storage spaces for cups, phones and wallets. Each front door pad can also hold a cup as well as a one-litre water bottle. If there's one thing Ford does exceptionally, it is sound systems. The Aspire gets a thumping four-speaker audio system that outdoes all the other cars here. 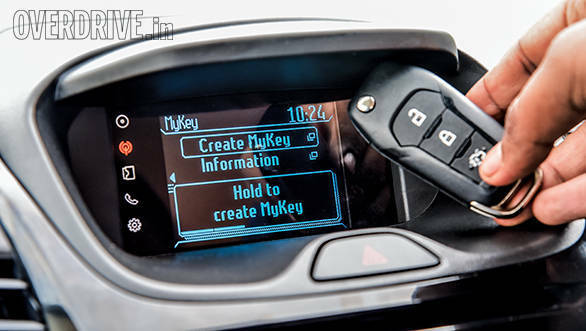 The interface on this top end Titanium+ also has Ford's Sync voice recognition system and a new MyKey feature. The latter essentially allows the owner to programme a speed limit to the car when the second key is in use  a good feature when handing the car over to a chauffeur or the young. 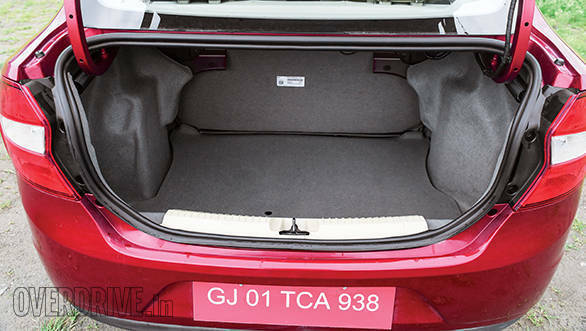 The Aspire has a reasonably spacious cabin with generous rear kneeroom thanks to the deeply scooped out front seats. Its sloping roof, however, does reduce headroom for tall passengers and the high transmission tunnel doesn't leave a lot of room for the middle passenger's feet. On paper, it has the smallest boot but we found it very practical thanks to a low and wide opening and minimal suspension intrusions. Before the Aspire, it was the Honda Amaze that was the easiest on our eyes. 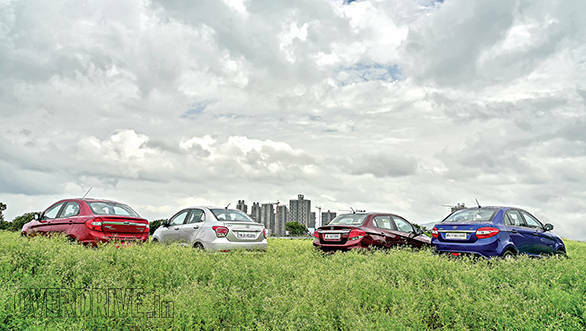 While there is a disconnect between the soft Brio front and the squared-off rear, the car looks quite proportionate in profile. What lets the Amaze down is its low rent looking interior. There's no issue with quality but the layout is rather drab and lacks automatic climate control. 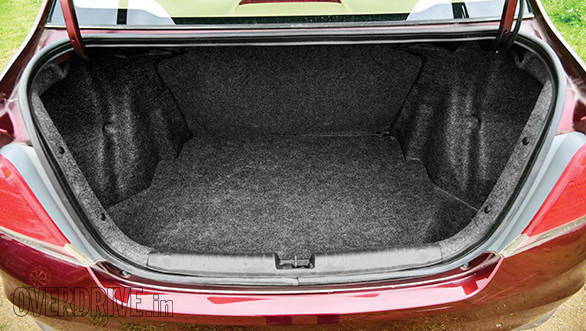 The Honda redeems itself by having the best rear seat  it has the most space and a fairly flat floor. The 400-litre boot is a tiny bit less spacious than the Xcent, but these two have the most usable boots. The Hyundai Xcent looks rather pleasant when viewed head-on, but the sides and rear are a little bulbous and out of proportion. It's no stunner on the outside but the cabin is a class act. It isn't as eye catching as the Ford's but the user interface is more intuitive. The rear is quite spacious but since the Xcent is based on the small and narrow Grand i10, fitting three passengers in the back is a bit of a squeeze. Rear passengers will, however, be treated to an air conditioning vent and a charging port. Park them side-by-side, and the Tata Zest looks the largest. It has quite an appealing design but I wish Tata was more adventurous - there's too much Vista in there. 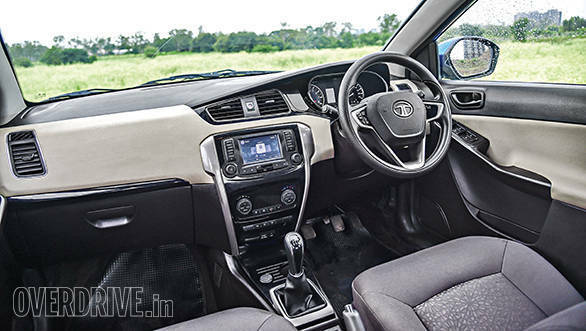 Tata did, however, do an excellent job with the classy dashboard and we really like the easy-to-use Harman touchscreen system. The car isn't perfect though, and there's a serious lack of storage spaces. The entire console has just one cup holder and the door pockets are wide enough to hold a sheaf of papers at best. The Zest has good rear knee and headroom, but it loses out thanks to a rather high transmission tunnel. 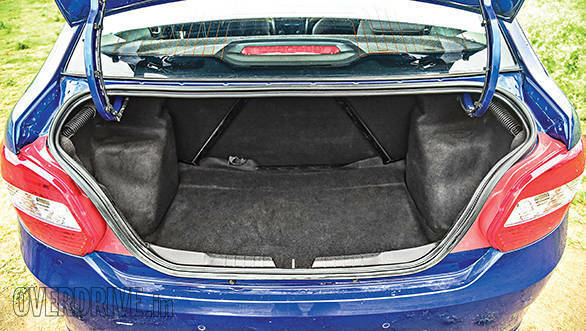 The space management woes extend to the boot that has a tall loading lip and the suspension eats into a significant amount of space. The Aspire gets the same 1.5-litre turbo diesel from the EcoSport but with a new low inertia turbo and revised engine calibration. The result is 10PS and 15Nm more juice that arrives lower and lasts longer in the rev range. On the road, the engine feels considerably more powerful than the improvements over the EcoSport might suggest. That's because the Aspire weighs about 250kg less than its similarly sized sibling. In fact, it's the lightest car here. The bump in performance is evident in every gear with more pulling power everywhere in the power band. Equally impressive is the top end performance  160kmph comes up with ease and our Vbox measured a top speed of 177kmph (nearly 190kmph on the speedo!). The 11.5s 0-100kmph run we recorded is also significantly faster than the other three. The last time we conducted this comparison the Amaze proved to be the fastest but also the most efficient. The Aspire offers significantly more speed but returns the same, and incredible, overall efficiency of 17.9kmpl. In fact, the Aspire's efficiency doesn't seem to waver much as the speeds go up. If you do a lot of highway driving, this car could turn out to be pleasantly quick and frugal. The Aspire is a pleasure for the driver with a precise and well weighted gearbox. The engine is consistently smooth and is the quietest of the lot, with only some minor vibrations creeping in at the pedals at higher revs. The Ford does the best job of isolating road noise as well. All told, the new Ford drivetrain is fantastic and a class above. 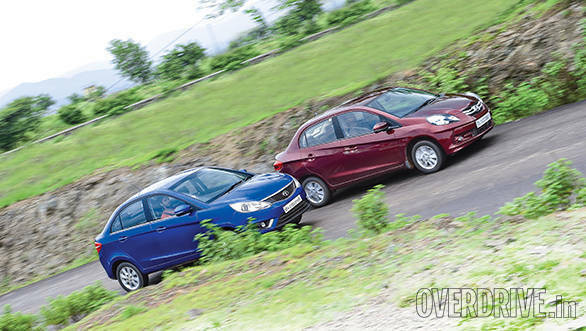 The Honda Amaze may boast the same 100PS but it feels very different from the Ford. The engine has a strong bottom end, but it also revs with urgency to its 4,000rpm redline. However, the Honda doesn't have the same linear feel, and power arrives in a strong surge above 2,000rpm. The firm, short-throw gearbox is fun to use but the Honda engine sounds quite gruff and loud. 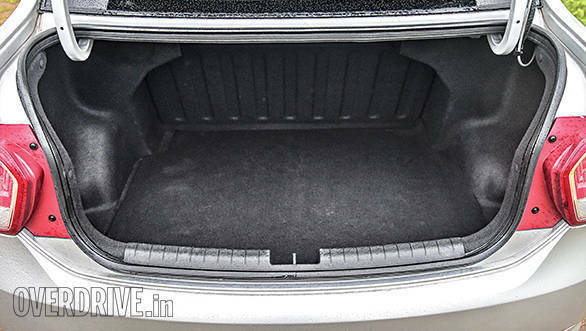 In fact, the Amaze could use better sound deadening, not just for the engine but also to damp out the excessive road noise that seeps into the cabin. Still, there's no arguing with that 17.9kmpl overall figure. Hyundai's Xcent is at a considerable disadvantage on paper - its one cylinder and 25 per cent down on power. But the Xcent's plucky 1.1-litre 72PS motor is actually quite impressive if you aren't hunting for outright performance. The 3-cylinder engine sounds a little clattery at idle but it smooths out above 1,500rpm. It is almost as refined as the Ford, impressive given the cylinder count. Naturally, this engine isn't going to set the charts on fire and the run from 0-100kmph takes a leisurely 15.1s. 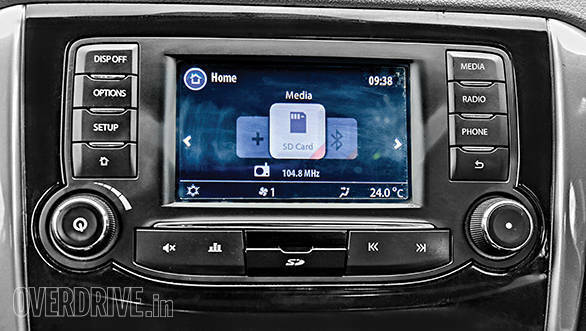 However, the Xcent will comfortably settle at a highway cruising speed of 120-130kmph. Limited bottom end grunt means more gearshifts in town, but the Hyundai has a very slick gearbox, albeit mated to a springy clutch that takes a little getting used to. The Hyundai loses out on efficiency, but not by much, with an overall 16.8kmpl. To be honest the difference between efficiencies here is so small that it's not worth making a buying decision based on just this parameter. Tata offers two versions of the MultiJet (QuadraJet in Tata lingo) in the Zest  75PS in the base two variants and 90PS/200Nm in the higher models. When the original MultiJet debuted in the Swift in 2008, it was a revelation. The motor was far more refined and seriously quick compared to the crude and smoky oil burners before it. But seven years later, the competition is making the Fiat engine feel its age and the Tata set-up isn't doing it many favours. It's not much quicker than the Xcent, taking 14.7s to hit 100kmph and the gearbox feels rough and disconnected. 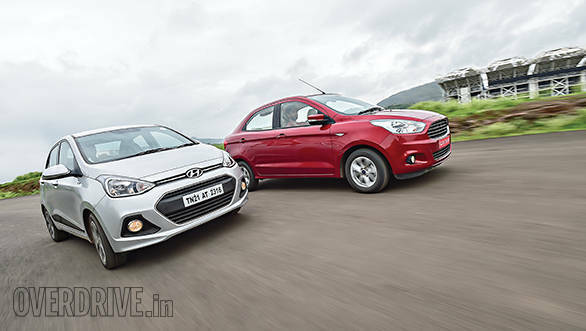 Despite being just 10PS down, the Ford and Honda outperform the Tata. With an overall 17kmpl, it is more efficient than the Xcent but can't match the other two. To make the Aspire more appealing to the masses, Ford has moved its focus from dynamics to comfort and as a result, the Aspire has the most supple ride here. Despite the new, softer set-up the Aspire still handles well although it no longer has the telepathic responses of the old Figo. What bothers me though, is the new electrically assisted steering - it tends to pick up minor disturbances and fidget in the hands when centred - not a very nice sensation. The steering lost the magic of the hydraulic system and you need to learn to trust it before pushing the chassis. All four have plenty of ground clearance but the Aspire is the first to scrape its chin. This is because of the front plastic splitter under the bumper that touches down in deep potholes. It is pretty harmless though, as the plastic is flexible and it bends upward on impact. The Amaze has a nicely balanced chassis that absorbs bumps just as well as it entertains the driver on a winding road. I quite liked the Honda's steering - a little heavy but precise. The Hyundai, meanwhile, tends to lean towards comfort and in that the Xcent succeeds. Ride quality is a little firm but decently absorptive and it doesn't thud or jar over bad roads. The Xcent feels nimble and obliges if you start to throw it around. However, the light electric steering won't really spice up things - you'll soon settle into a steady rhythm. An exciting mountain carver this car is not. The Tata perfectly treads between good ride and decent handling but isn't breathtaking at either. Passengers in the spacious cabin will have nothing to complain about and the driver will find a reasonably good handler but neither will rave about the experience. When the Zest came out last year it blew us away in terms of how big a step ahead it was from any Tata before it. It was well designed, comfortable and had a good set of features. All that was left to be seen was whether Tata could cross that final hurdle of quality and reliability issues that has plagued its reputation. Sadly, there's still some way to go. Our test car had electrical issues, broken plastics and creaky suspension. To be fair, the car had clocked over 7,000 undoubtedly hard kilometres before it came to us. But the Xcent here had no such issues and it had done nearly 23,000km including being recently used as a recce car for a rally! The engine was smooth, cabin quiet and all features in working condition and constantly spoiling us. The Hyundai has the others thoroughly beat when it comes to unique kit like its rear AC vent, auto day/night mirror and keyless entry and go. 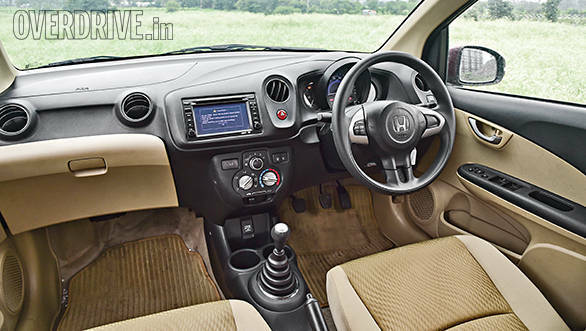 While the Honda Amaze may not have all those toys, it beckons with its spacious cabin and fast but frugal drivetrain. Choosing between these two is hard and means looking within and asking what you really want from your car. And that's precisely why the Ford Figo Aspire wins this. With the Ford you don't have to choose  it offers power, efficiency and luxury, all in one package. Priced at Rs 10.3 lakh, it's Rs 30,000 more than the Honda. But where the Amaze struggles to justify its premium, the Aspire is a more complete package with its six airbags, leather seats, Sync and MyKey features. I do miss having the Hyundai's keyless entry and a parking camera assisted by sensors, but at least you can purchase the latter as an option. Regardless of the premium, the Aspire is our winner. But here's the kicker - for Rs 9.6 lakh or about Rs 7,000 more than the Xcent you could have the lower Titanium variant that still comes with dual airbags and ABS. That makes for fantastic value and it's clear that Ford has built the right car. What's left to be seen is how well our market accepts it.